Watch out, as this is definitely going to be among the biggest Events of the Season! For the fourth year in a row, we are celebrating Cap d’Agde, the “Most Sinful Place in the World”. Krystal Club will introduce you the Naked City during a hot Venetian weekend, culminating in a WARM UP PARTY on Friday and a LUXURY DINNER PREPARTY at KRYSTAL followed by the BIG PARTY on Saturday. 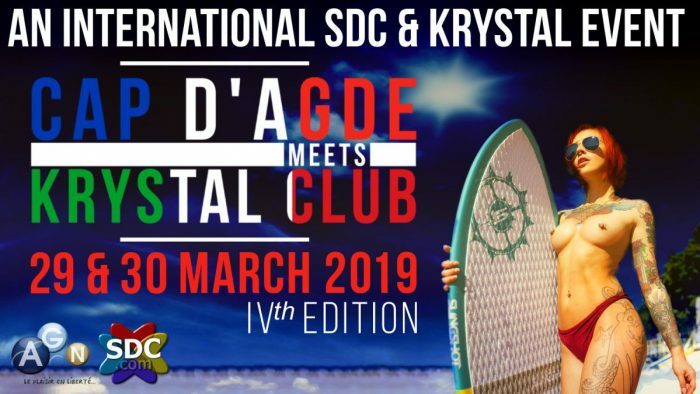 Whether you are already aware of this magic place or not, KRYSTAL along with AGN will present you Cap d’Agde and the great week we are setting from 18 to 25 July at Jardin de Babylone called KRYSTAL RENDEZ-VOUS when all the events will be organized by KRYSTAL with their own DJs and Performers. For one week KRYSTAL wiil be hosted by AGN and something to remember will happen. Direct flights from Bergamo to Beziers (twice a week) are available this year! Every high-level Party needs a Dress Code, so –assumed that Cap d’Agde is the place where “All Is Possible”, the theme for Saturday’s Big Party is “BARE AS YOU DARE”: feel free to undress where, when and how much you want. Let’s give KRYSTAL a touch of Cap ambiance! All events are independent: you are free to choose whether to join the whole program or just part of it. We will be putting one of our biggest act on this Event : hopefully, this will lead to some incredible atmosphere and memories of the CAP D’AGDE MEETS KRYSTAL CLUB weekend. Krystal club has over the years become one of the most reputable and hyped clubs in Europe for his friendly vibe, the sharp music policy, the attention to the buffet and bar. The constant desire to stay fresh and try new things has kept Krystal ahead of the game. Experience Krystal: experience the best DJ booth a swingers club has to offer, taste the best cocktails, the best food, and meet the classiest couples of the Lifestyle! VIP tables are available to those who would like to party with a little more luxury, enquiries made via SDC (to KRYSTALCLUB) or info@krystal-club.it, or calling +39 331 2434209. As a sold out is expected, having a reserved spot might assure you and your friends a more comfortable experience. For your night stay, we suggest the 3-stars BEST WESTERN ARIES HOTEL or the 4-stars VIEST Hotel and VICTORIA Hotel. If you have any further questions, please do not hesitate to contact KRYSTAL CLUB.